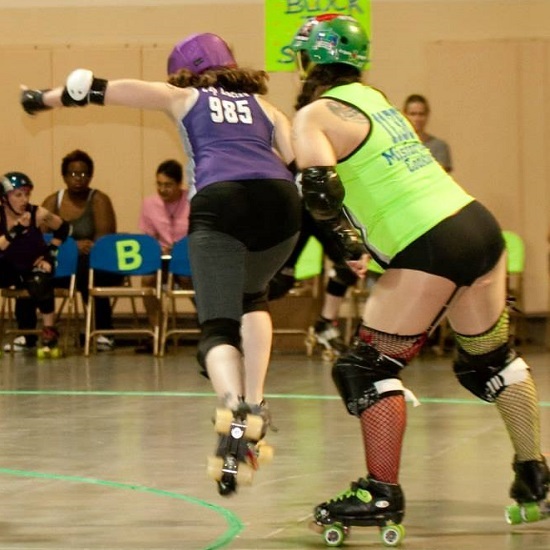 Red Stick Roller Derby | August’s Capital Defender of the Month: Lap Lacian! ← July’s All-Star of the Month: Captain Twitch! August’s Capital Defender of the Month: Lap Lacian! My boss used to call me “Laplacian” because I was from LaPlace. When brainstorming for a derby name, I mentioned it to a fellow skater in a conversation and she suggested I use it as my derby name. My number “985” is the area code of my hometown. I usually block, but I have been jamming a lot lately. What is your favorite thing about derby? Probably that there is so much to learn. I’ve always enjoyed a challenge, and the challenges seem never-ending in derby. Every week at practice there is something new to learn, whether it’s strategy or just basic footwork. I’m always eager to see what I will learn next! What first attracted you to the sport? A friend of mine mentioned it to me. I visited a practice and fell in love! I was pregnant at the time, so I couldn’t join right away, but I was determined to return! What is the most valuable thing you’ve learned from playing? I’ve learned that it takes a lot of practice and hard work to play derby! There is always something new to learn and you will always have opportunities to improve. You’ll never improve unless you practice! I’ve also learned that taking pointers from fellow skaters (especially veterans) can be very beneficial. Criticism isn’t always easy to hear, but it’s just another way to help improve your game! What are your goals as a player? My goal is to become a better player all around. More so with my jamming! What is your most memorable moment on the track? My apex jump against Northshore Roller Derby! I had never done one before in a bout, and when I landed it, the crowd started cheering, which was pretty awesome! What type of gear do you prefer? I’m currently using Shawn White pads, which are pretty good. I always wear volleyball knee pads under my knee pads for extra protection. (A tip a read about in Beat-Ho-Ven‘s article). My helmet is a triple eight helmet, which I love! Do you have a favorite song to skate to? “Desperate Measures” by Marinas Trench and anything by Fall Out Boy. What is your favorite sign or cheer you’ve seen or heard from the crowd? I’ve seen signs that say “Lap ‘Em” which I thought was pretty cool. I love all of the cheers that we have for an awesome jammer, Fun Size! Hearing the cheers for her always make me smile. Lap Lacian jumps the apex against Northshore! If you could arm wrestle any person in the league, who would it be and why? I guess I’d arm wrestle Val Killmore. She looks super strong, and I love a challenge! Is there a teammate with whom you work best with? I work pretty well with Photobomber and Schexorist. When jamming, they always seem to make the biggest impact in the pack in order for me to get through. What sports did you play before derby? I played softball for a local league in my neighborhood until I was 15, and still play occasionally for a mixed team in my area. I was part of my high school’s dance team and volleyball team. Well, I play derby! I also spend most of my time with my 4 year old son and my husband. I try to keep my son active, so we spend a lot of time at karate, playing outside, and of course skating when we are together. Do you have advice to give anyone thinking about taking up derby? Do it! What do you have to lose? You’ll meet amazing people and learn so much. Not just how to skate, but also the feeling of being part of a team and a great feeling of accomplishment. How long have you been playing derby? I joined in October 2012. We are coming up on my 1 year anniversary! Please do not reproduce, print, or use photos in any context without the express written permission of the photographer.